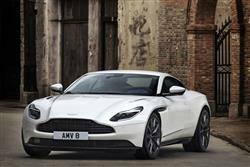 Find out everything you need to know on the new Aston Martin Db11 from independent vehicle review website Car And Driving. You can watch the video review to the left to see more of the car or read their written review below to get a true insight from an expert in the automotive industry. The DB11 is the backbone around which the rest of the Aston Martin range is being built. Jonathan Crouch takes a look at what's on offer. The DB11 is the Aston Martin of choice for those craving something sleek and graceful rather than overtly aggressive. This, arguably the classiest car in the Aston range, is primarily a consummate sporting luxury GT, but can play the sportscar when required thanks to clever adjustable damping. It's very desirable indeed. The DB11 is nothing less than the most important car in Aston Martin's history. Those are the company's words, not ours, this being one of four new modern era models that will rejuvenate this famous brand. The others, by the way, are new-era versions of the Vantage and the Vanquish, plus (inevitably) there'll be an SUV, the DBX. But the DB11 is our focus here, an all-new Aston that, for once with this brand, looks like an all-new Aston - and is. It replaces one of the most successful cars in the Newport Pagnall company's history, the DB9 model that sold between 2004 and 2016, a ca developed in the old Ford-owned era. These days, Aston has much more control of its own destiny - though it is now 5% owned by Mercedes-Benz - more of which later. But let's get on to what this DB11 is all about. In its top form, the DB11 gets an Aston Martin-designed 5.2-litre V12 developing 608bhp. There's definitely something about the gloriously fearsome bark of the twin-turbocharged engine when it barks into life - or at least there is if you start it in 'full woofle' mode; there's also a 'quiet start' option, should you want to make a soft getaway. That noise is instrumental in preparing you for a unique experience as you nose out into the traffic. A thoroughbred sportscar deserves a thoroughbred engine and this is exactly that, with an exhilarating roar under hard acceleration, yet with a growl that becomes muted and melodic when cruising. The alternative powerplant is a 4.0-litre V8 borrowed from Mercedes-AMG (the same as that used in the Mercedes-AMG GT) putting out 510bhp. With both engines, 62mph from rest takes about 4 seconds, but the top speed of the V12 is a little higher than that of the V8 (200mph as opposed to 187mph). In both cases, drive is dealt with via a super-smooth paddleshift eight-speed ZF automatic gearbox mounted at the rear and driving the rear wheels. And there's a drive mode control system that independently controls the powertrain and the chassis via 'GT', 'Sport' and 'Sport Plus' options, all of which are quite viable for road use. You'll be pleased to know that this isn't just a mild structural update of an older Aston design with some flashier bodywork. Fortunately, the days of new Aston models all looking pretty similar to each other seem to be behind us. This looks like the new generation model it is. What's been delivered here is completely all-new architecture as part of a body that's only marginally larger than that of the old DB9. The wheelbase is 65mm longer than the DB9's by there's only 50mm more of overall length. The front overhang is 16mm shorter and the rear overhang is 11mm longer. More significant though, is the increase in track width (74mm at the front and 43mm at the rear), which is why this DB11 looks so much more muscle-bound than its predecessor, despite the fact that overall width has only increased by 28mm. Equal effort has been expended in the interior, which is trimmed in gorgeous brogue-like leather and features classy trimming that is exactly what it looks like. It is a bit disappointing that the single column stalk off the steering wheel is very obviously borrowed from a Mercedes, as is the centre-dash infotainment screen. Through the wheel, you view a fully digital instrument panel and there's a proper start button with keyless go, rather than the previous Aston system that required you to clunkily put an 'emotional control unit' key into the dash. There are a pair of small child-sized rear seats. And a 270-litre boot. Prices start at around £145,000 for the V8 version of this DB11 but most, we think, will want to find the £158,000 necessary to own the 'full-fat' V12 model. Whether those figures represent good value for money depends upon your perspective. You could argue that a Maserati Gran Turismo MC or a Mercedes-AMG GTS would cost you much less. But then, so would a Jaguar F-TYPE SVR or a Porsche 911 Turbo - where do you draw the line? These are all less exclusive and by contrast, mass-produced choices. For something with the same kind of feeling of exclusivity that you get in this DB11, you'd need to pay a very great deal more. This car's most obvious and probably closest rival is the Aston Martin's old-tech V12 Vantage which costs only slightly less in comparable 'Sportshift III' automatic form but uses a much thirstier old-school 6.0-litre 573bhp V12 engine. With a DB11, the focus is more on sportiness and less on comfort. At the end of the day, it depends what you want. As you'd expect, the asking price includes just about everything you could really want in terms of equipment, but of course there's lots of scope to spend more and personalise your car with aesthetic flourishes and hand-crafted interior additions. If you've managed to shinny up the greasy pole far enough to be able to afford an Aston Martin DB11 it's doubtful that you'll be overly concerned with the trifling matters of economy and emissions, but they mean a great deal to Aston Martin and here's why. The company needs to reduce the average CO2 output of the models across its range or face punitive EU fines. It's mildly amusing that 'engine downsizing' in 'Aston-speak' means dropping the size of the required powerplant to 'just' 5.2-litres and adding twin turbochargers to it. Nevertheless, that's made quite a difference in terms of efficiency when you compare to the old DB9 (which chugged out a decidedly old-school 389g/km of CO2 and averaged only 17.2mpg). In comparison, the DB11's emissions in V8 form are rated at 230g/km of CO2, while the combined consumption return is rated at 28.5mpg. For the V12 version, the figures are 265g/km and 24.8mpg. To give you a perspective on just how much of an improvement this represents, we'll tell you that the old 6.0-litre V12 still fitted to the V12 Vantage model manages 19.2mpg on the combined cycle and 343g/km of CO2. The founders of this brand, Lionel Martin and Robert Bamford, had a clear vision. To create sportscars with a distinctive character. Cars built to a high standard, exhilarating to drive and to own. Cars with power, beauty and soul. Over around 100 years, Aston Martin has made motorcars just that way, building well over 50,000 of them, 80% of which are still in use, cherished, driven and raced by enthusiastic owners all round the world. In all of this history though, no model line has been more significant to the future of this marque than this one. The DB11 as we've said is the first Aston of the modern era. The first to show that the company can now take on its German and Italian rivals head-to-head, wheel-to-wheel. Faster, more sporting models will in future follow this one from the Gaydon factory, but arguably, there's nothing quite like a DB11 when it comes to pure GT-style elegance. There are certainly quicker, higher-tech or more sharply handling options in the market. But when you've miles to put on the clock and want the journey to feel special rather than just effortlessly rapid, it's hard to think of anything much better.